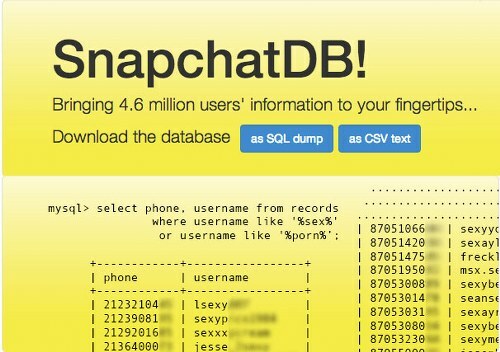 Web page SnapchatDB.info is offering 4.6 million phone numbers and matching usernames from Snapchat app users. You can download this list as SQL dump or as CSV text file. According to SnapchatDB, people tend to use the same username around the web so you can use this information to find phone number information associated with Facebook and Twitter accounts, or simply to figure out the phone numbers of people you wish to get in touch with. Hackers had redact the last two numbers but who knows, maybe someday they even reveal the last two numbers.